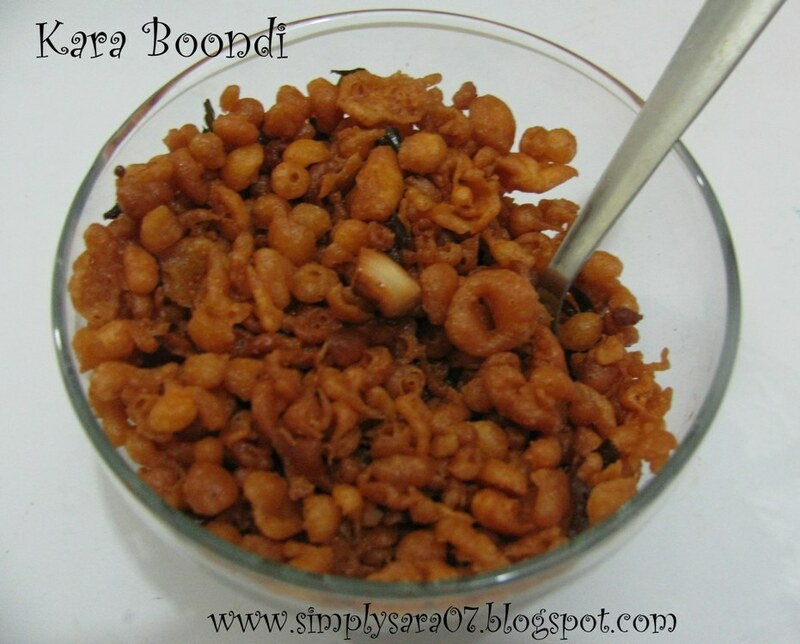 Kara Boondi is a very famous deep fried snack and savoury. Its good to eat at tea/coffee time. 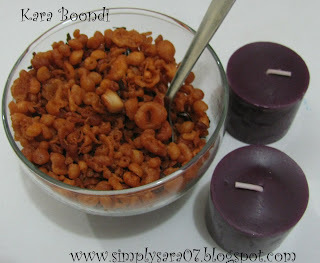 This can also be prepared for Deepavali. Its available in most of the shops in India. I just love it in Adyar Anandha Bhavan in Chennai and Bangalore. I sometimes make from leftover Bajji Maav/Batter. Mix Kadalai Maav, Chola Maav, salt, red chilli powder with little water to form a batter. Heat oil for deep frying, reduce flame take Jara/Jarni/Ladle with holes and pour the batter in this. Then deep fry those till brown and keep it in a bowl. Do the same with the balance batter. After completion of the batter, deep fry cashews, groundnuts and curry leaves. Add these on the Boondi. Kara Boondi is ready to eat. This can be served with any sweets or as it is. Its tasty for rasam rice and top it for Bisibelebath Rice. Looks yummy!! Crunchy and satisfying snack. Love munching these crispies, have to make some soon..